Back for another major show, the Dave Matthews Band will perform live at the DTE Energy Music Theatre on Tuesday 7th July. The show will consist of 2 full sets from the band best hits, with a mix of electric, acoustic and multi-instrumental music and the phenomenal vocals from Dave Matthews, you're in for the biggest audio-visual treat of the year! Grab your tickets now and beat the summer rush! 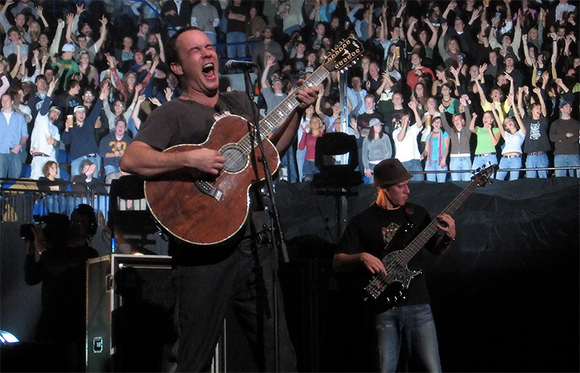 Dave Matthews was born in Johannesburg, South Africa. As a child he moved around America with his family, including his father, a physicist for IBM. A self taught musician, he found success working with his band between 1990 to 2003, initially playing in small venues, frat houses and other college venues. Word spread quickly through America, Achieving a devoted following. After the success of touring America, the band released their debut album "Under The Table And Dreaming" which reached 11 on the Billboard 200. Following the success of the bands second album "Crash" which debuted at No.2, they hosted a live performance at New York Madison square Garden, which sold out in under 3 hours. Their 2005 album, Stand Up, topped the Billboard charts in its first week, and now they are touring across America, selling out venues as they go.